Codilis & Associates, P.C. represents corporate clients in the consumer financial services sector. I oversee Cook County related matters for the firm—supervising and training attorneys, and providing direction and oversight to the firm’s various departments as it pertains to Cook County. I also contribute to the firm’s efficiency as it responds and advises on various developments in the law, from federal regulations to local general administrative orders. 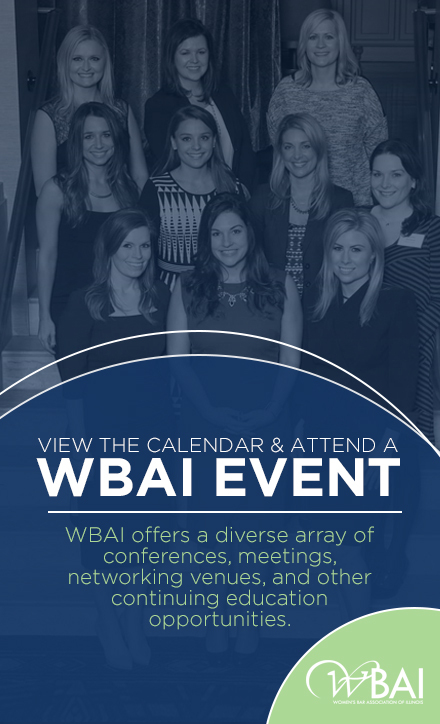 I am a member of the WBAI because it is an organization that promotes the interests of female attorneys, and this advocacy aligns with my social and personal interests. But I am an active member because the WBAI is comprised of so many phenomenal leaders and members; through them it has offered me new friendships and connections, support, and educational opportunities. This fall is absolutely extraordinary! I have enjoyed several fantastic events: WBAI’s 2016 Top Women Lawyers in Leadership; The Women’s Treatment Center’s Fall Fundraiser; and, The Cara Program’s Tribute to the Stars. And, I have loved all the moments outside with my family in the beautiful weather we’ve had. I met my husband on the twenty-eighth floor of the Daley Center. I’m always amused it disappoints most non-lawyers that we were not adversaries on some big case at the time. But being both plaintiff’s attorneys has afforded me the opportunity to work with Lou—and that has been one of the greatest joys of my life.